Today we’re heading into Marylebone in central London. It’s kind of behind Marble Arch (north of Oxford Street) and an easy place to get lost with its labyrinthine streets lined with some of the Capital’s trendiest eateries and bars. 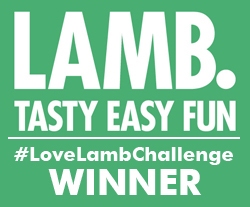 Also a good place to get lost – you certainly won’t go hungry or thirsty here. When I first moved to London I lived very close to the Marylebone Road and soon learned of the trickeries the English language throws at you when it comes to correct pronounciation. And the importance on getting it right! How they laughed when I told new friends I lived off the Mary-la-bone road. It’s nothing to do with Mary – despite the spelling – or la either. I was soon murmuring Mar-lee-bone under my breath until it settled for good in my grey matter. Don’t get me started on the hilarity I caused on telling people I worked in Grosvenor Square (even trickier to pronounce), but that’s another story. Anyway, back to our actual destination for today, set in the lively streets of Mar-lee-bone. Lurra (which means land in Basque) is the second restaurant from Melody and Nemanja and opened in 2015. Their first was Donostia (which is the Basque word for San Sebastian), which opened in 2012 and is just down the road. The legend goes that the pair were inspired after an unplanned stop in San Sebastian to leave their City careers and go into the restaurant business, opening establishments offering traditional Basque-style cuisine properly done. Must say I’ve had plenty of similar revelations myself but have never actually got down and done anything about it – so good for them…and for making a success of it. Lurra is bright and modern with lots of pale wood and glass – and a lovely courtyard off to the side. Love a courtyard – straight on my list for next year’s summer eating. The menu has happy Spanish familiarity about it, though I’ve never been to San Sebastian – something of a culinary hole for a Spainophile like me. Oh well, I’ve put that on one another of my many lists populating my many notebooks. 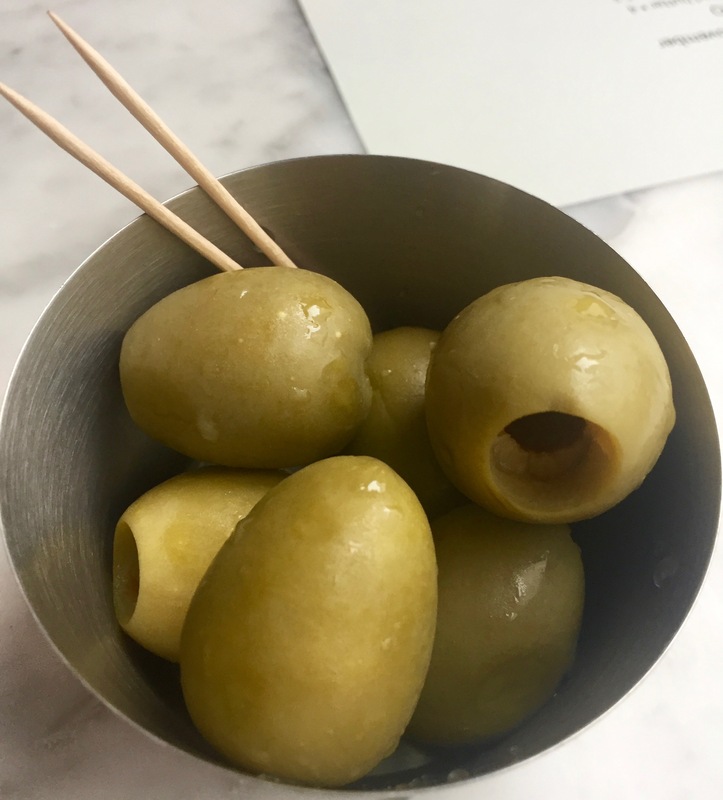 Gordal olives have happily become a regular fixture in my foodie life recently. Gordal means fat in Spanish and these plump babies are firm and juicy. Truly the king of olives. And then there’s anchovies, another Spanish star. 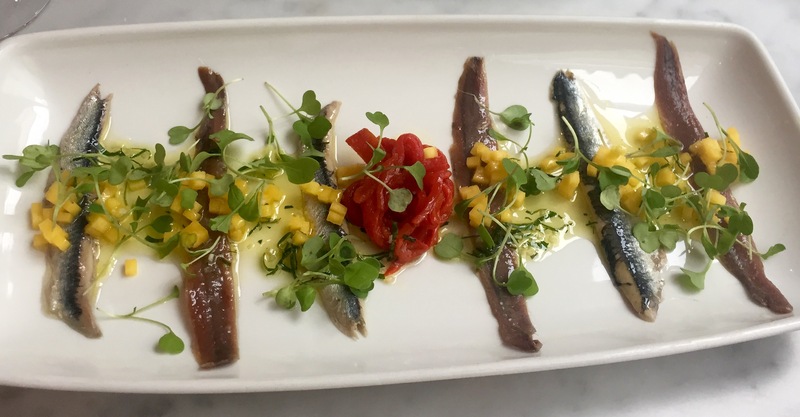 This dish is called Matrimonio which, fairly obviously, means marriage in Spanish – and a great one it is too, with a mix of salted anchovies and boquerones which are marinated in vinegar, olive oil and garlic. Served up with mango vinaigrette and a pile of the sweetest marinated peppers. The flavours hit your taste buds with a real zing, and the different textures complete a joyful dish. There’s a range of tapas dishes and a section called Large Sharing Plates, which includes a yummy-sounding slow-cooked suckling lamb shoulder. 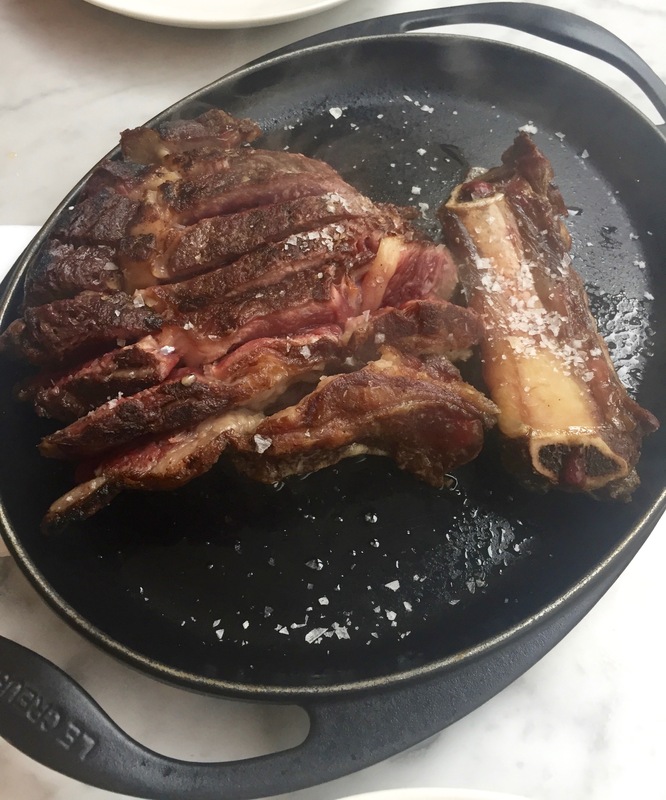 Feeling like a good meaty hit we went for the 14-year Rubia Gallega – Galician Blond steak dry aged on the bone. It was served on very medium-rare on a hot iron platter with a sprinkling of salt. Plenty for two to share, it’s rich and served with the bone on the side – a bone I wanted to take home to chew on. And somewhat appropriate that I was eating a bone in Mar-lee-bone. Sorry, couldn’t resist that. Steak and tomato is a dream combo for me. And the Spanish know their tomatoes. 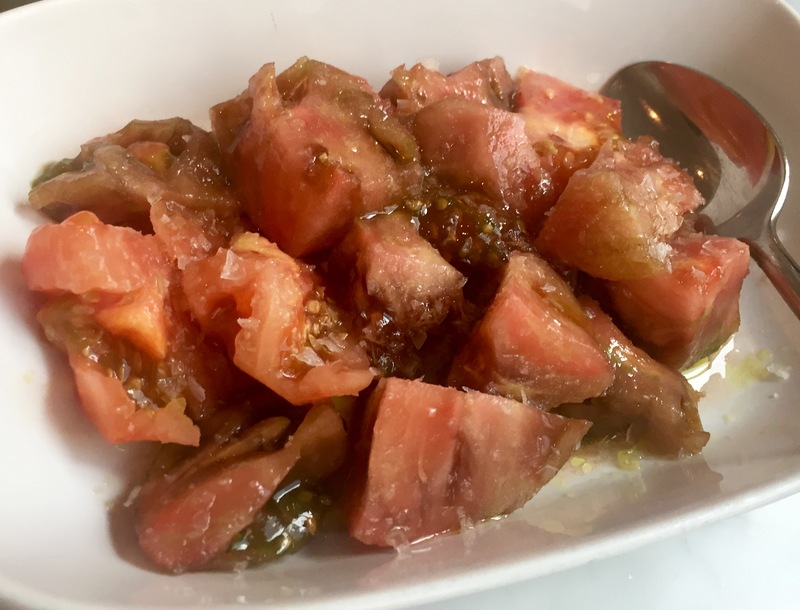 This is called peeled Pata Negra tomato salad and is marinated in some kind of magic. Sweet, soft and tangy. We started off with a glass of bubbles. 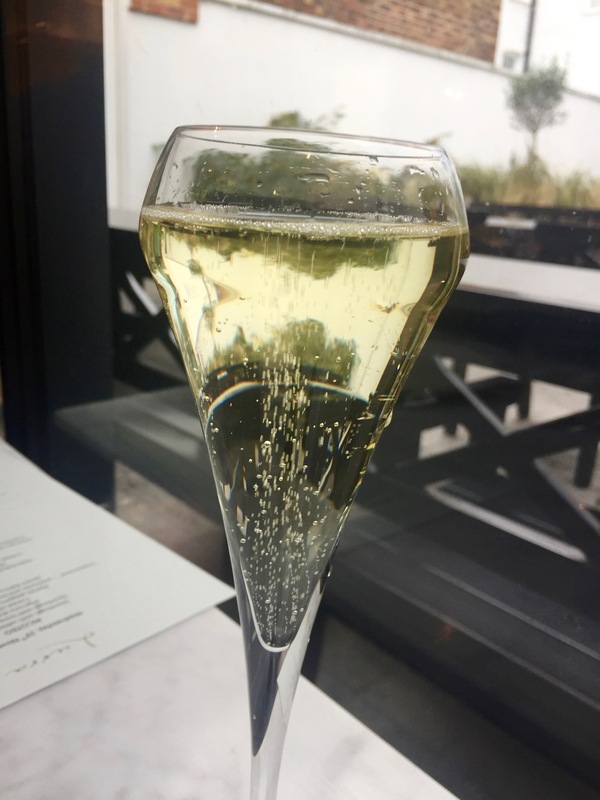 Cava is one of my favourite drinks and looks especially tempting in this stylish glass. Oh and there’s the courtyard in the background. Another happy Spanish lunch in London Town. So happy I can enjoy those irresistible Basque flavours without the need for EasyJet. Lunch for two cost £85.50 without wine. Most of that went on the stunning steak which is £65. White wine starts from £22 a bottle, rose is £34 and red starts from £24. It’s worth mentioning that the restaurant has a very special selection of one of the most fabulous Spanish wines ever (in my opinion), Vega Sicilia, which you can enjoy for £280 a bottle. I better start saving now! Lurra is at 9 Seymour Place, Marylebone W1H 5BA.